I'm super excited to share with you all the beautiful Kristy Woodson Harvey today! Kristy and her mom Beth Woodson are a design duo from North Carolina that write the blog Design Chic. I follow Design Chic on Pinterest HERE and read their design blog HERE. Today I'm honored to share with you her new book Dear Carolina. That's right, this designer and writer has become an author too. I was anxious to get my hands on this book about a Southern design mom and her life's twist and turns as God knocks the socks off of her normal. I loved the design vocabulary and fashion references but most of all I loved the moral at the end of the story. Seeing inside every mothers heart and head, Khaki unfolds the truth we all try to hide behind in our career facades. That what truly matters is family and they come first "without needing to apologize for it". Beautifully written with whit and wisdom, Kristy reaches the readers heart and soul. 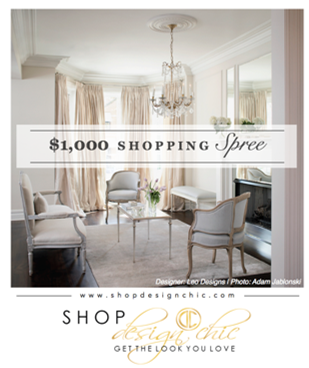 Kristy is offering a $1,000 Shop Design Chic Shopping Spree to one lucky winner. To enter: Send proof of purchase of Dear Carolina (photos are fine!) to readdearcarolina@gmail. Every book is an extra entry! Also receive a free e-copy of the Dear Carolina Companion cookbook, full of favorite Southern recipes from renowned bloggers and family members, and Dear Carolina printable quotes just for entering! What wonderful compliments! I'm so thrilled that you would take the time to share Dear Carolina with your readers. Thank you so much! Impressive posts. I liked the details about it. Thanks for the sharing.